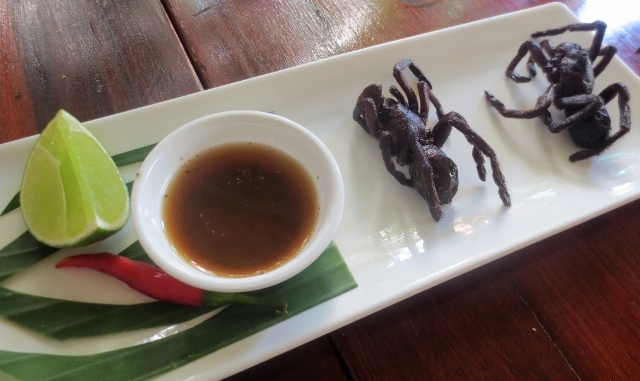 I was joking – sort of – at a restaurant in Phnom Penh, Cambodia’s capital city, after the waiter brought two of the large and hairy deep-fried arachnids to the table following the main course. At first, I mainly just wanted to photograph the dish popular in rural Cambodia, attractively presented on a serving plate with a lime and spicy dipping sauce. But the rest of our group dared me into taking it a step further. I recently spent a week cruising the Mekong River in Vietnam and Cambodia aboard the Scenic Spirit, a 2-year-old 68-passenger ship owned by Scenic Cruises, an Australian-owned high-end line with a growing presence in North America. Most of our passengers were from Australia and England; I was one of five Americans on the trip. 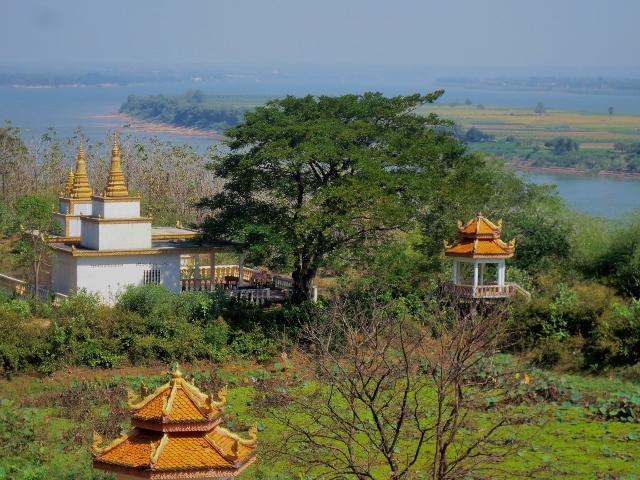 Mekong cruises offer a chance to sail past ancient hilltop pagodas, floating villages and seemingly endless fields of rice, fruit plantations and sugar cane. And you’ll do so in relative solitude compared to cruises on more heralded rivers in Europe like the Danube, Seine and Rhine. Indeed, during the Vietnam portion of the trip, we didn’t encounter even one other cruise ship, a pleasant difference from river trips in Europe where there are often so many ships parked in port at one time, you need to walk across several other vessels to reach your own. Known as Southeast Asia’s “rice bowl,” the Mekong is the lifeblood of hundreds of millions of people in the region, who use the river for trade, transportation, farming and fishing. 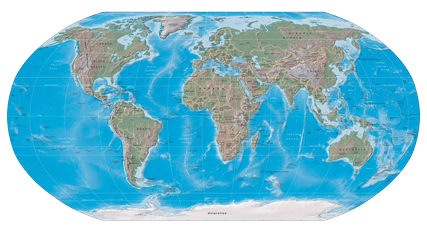 The river traverses six Asian countries – starting in China’s Tibetan Plateau before meandering through Myanmar, Laos, Thailand, Cambodia and Vietnam, where it empties into the South China Sea. We leisurely covered about 180 miles over seven days on a small portion of the river, sailing upstream from My Tho, about a two-hour bus ride southwest of Ho Chi Minh City, and disembarked in Kampong Chan, Cambodia. Most of the ship’s passengers also booked post-cruise land tours of Angkor Wat, the world’s largest religious monument, in northwestern Cambodia. Aside from the tarantula, I sampled rice wine infused with a venomous cobra snake (the locals call it “Vietnamese Viagra,”) and a fiery red chile-pepper I picked right off the vine that made a jalapeno from back home taste like a bland cucumber in comparison. 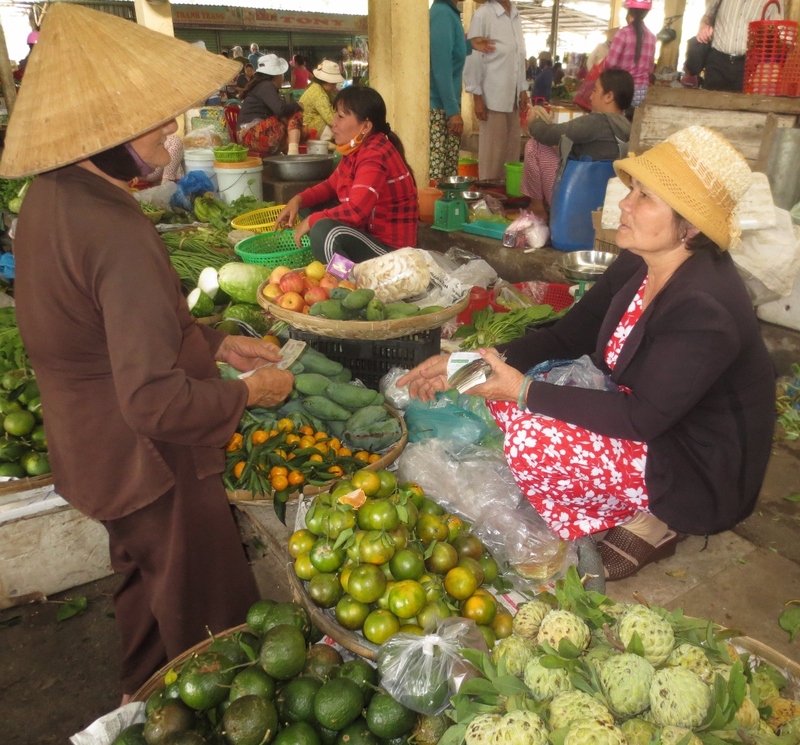 As most of the villages we visited didn’t have docking facilities for large boats, the Scenic Spirit would drop anchor in the Mekong and we would take sampans – long, narrow wooden boats – into towns along the river. Once on land, we rode rickshaws, tuk-tuks and ox carts to see the sites. I especially found meaningful a visit to the home of a 70-year-old man who had fought in the South Vietnamese army alongside Americans. After the war, he was sent to a “re-education camp.” It was a stark reminder of the region’s tragic past. 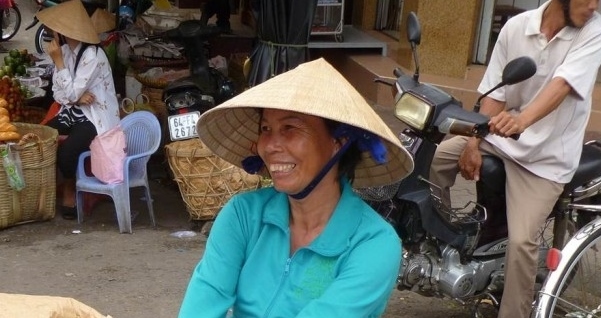 Despite all they have endured, I have found the Vietnamese some of the friendliest people on the planet, always quick with a smile. As far as any lingering anti-American sentiment from the war years, we never experienced the slightest hint of it. Duc Ho, one of our Scenic tour directors, says attitudes of the Vietnamese people changed dramatically in 1995 when – thanks in large part to the work of Arizona Sen. John McCain — the two countries re-established diplomatic relations. While we waited on the Mekong to clear immigration at the Vietnamese-Cambodian border, Scenic brought onboard a local dance troupe, which performed a traditional acrobatic Vietnamese lion dance. It’s believed the dance brings good luck and fortune, not to mention a chance for the ship’s passengers to admire some delightfully animated costumes (see video shot by the author: Vietnamese lion dance). In fact, one of our Scenic guides, Mao (nicknamed “The Chairman,”) had spent six years himself as a monk and offered our group unique insights into the faith and the integral role it plays in Cambodians’ lives. At the monastery, we sat on the floor of a temple for a private blessing as two monks wearing traditional saffron robes chanted Buddhist prayers and tossed jasmine flower petals at us (see video shot by the author: Buddhist monks chant blessing). We also visited a monastery on a hilltop overlooking the Mekong called Wat Hanchey, home to novice monks, most of whom are teenagers. 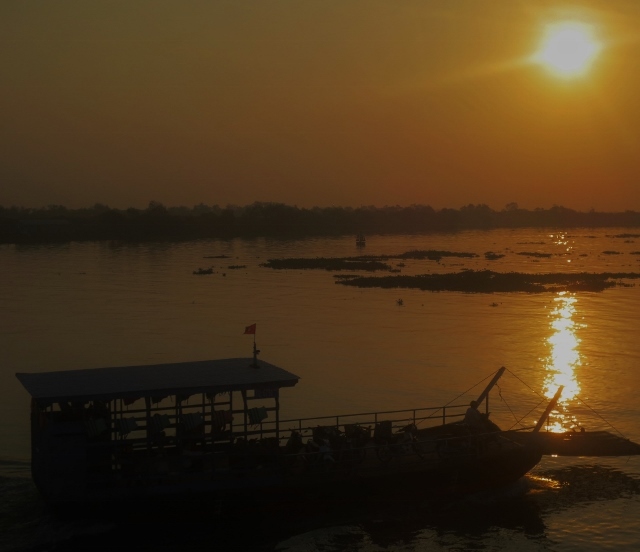 The Mekong is ideal for travelers looking for a less-crowded, more authentic experience than is found on many other river cruises. This year just 19 ships catering to foreign tourists are cruising the river; most hold well fewer than 100 passengers. 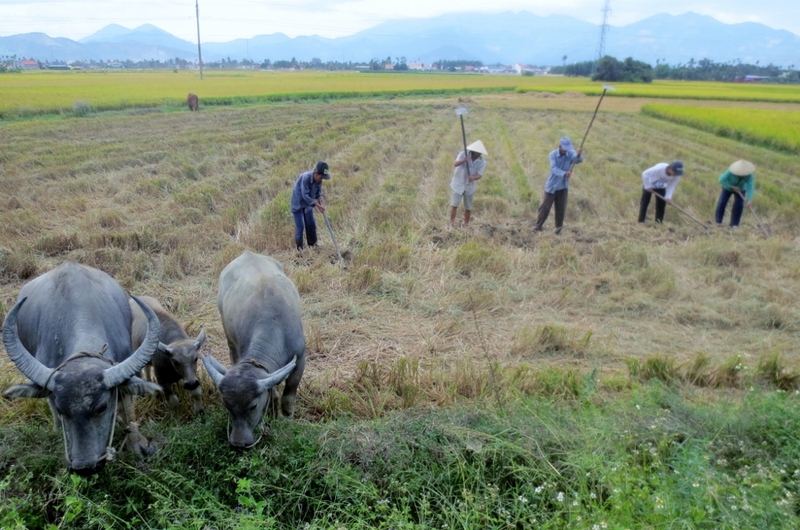 At first glance, it’s an idyllic scene — farmers in rural Vietnam tending to their rice fields with primitive tools while a small herd of water buffalo peacefully grazes in the foreground. If it weren’t for the electricity poles visible in the background, it’s a scene that one would have imagined in the Vietnamese countryside centuries ago. But pictures don’t always depict reality. In this case, what I photographed was a scene staged just for us — two busloads of tourists who had paid about $100 each to tour rural Vietnam while our cruise ship was docked near the port city of Nha Trang. As we filed out of the buses in the middle of the afternoon, we were told by our guide that we would be seeing a “demonstration” of what life was like for local farmers. However, afternoons in Vietnam can be stiflingly hot and humid and the locals typically do their outdoor work early in the mornings, at about the same time we were stuffing our faces at the breakfast buffet on the ship. So, our guide explained, the farmers would be reenacting their daily routine just for the benefit of us and our cameras. As far as I as could tell, they weren’t really accomplishing anything other than looking good for the photo-op. With some farmers wearing traditional Vietnamese bamboo hats known as non la, their hoes banged aimlessly against the ground while our group clicked away. I remember reading in the tour brochure that we would also see water buffalo, an iconic symbol of rural Vietnam. Right on cue, I heard the jingle of bells and a small herd of water buffalo was paraded across the field and began grazing right in front of us. Our cameras clicked away at an even faster rate than before. I had my coveted photo. But it’s lack of authenticity left a sour taste in my mouth and swayed me not to include it in a batch of pictures I submitted to a newspaper, which published an article I wrote about the cruise. As a travel writer and photographer, I often come across scenes that are less than authentic. This is increasingly becoming a problem for seasoned travelers as places that used to be off-the-beaten-path are now becoming overridden with visitors. It can sometimes be difficult to determine what’s real and what’s staged to make the tourists happy. In this case, the scene was clearly staged. That’s not to say, though, that the entire day had been a southeast Asian fairytale. 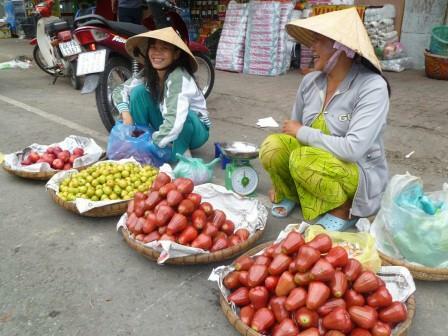 We also had visited a local market in Nha Trang, a city of about 400,000 people on the country’s south-central coast. If you want authenticity, visit a local market and watch the locals shop for locally grown fruits, vegetables and the indeterminable body parts of all sorts of animals you’re not likely to see on the shelves at your local Safeway. As our time at the rice fields concluded, our guide asked us to board the bus so we could head to our next stop on the tour. We had to be back on the ship in time for dinner. Lobster-tail was on the menu. As our buses drove away, I could see the farmers drop their hoes as the water buffalo were led back to their corral. 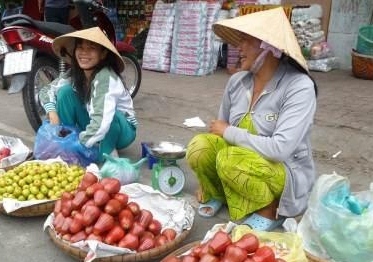 I’ve never met a people as quick with a smile as the Vietnamese. For a country that’s endured so much turmoil and tragedy in the past half-century, its people seem remarkably upbeat and cheerful. 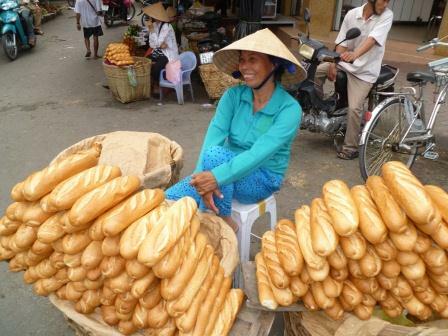 I took the photo above of a Vietnamese woman selling baguettes along the road in a village in the Mekong Delta. A Vietnamese baguette, known here as bánh mì, tends to have a thinner crust than its French counterpart, and is sometimes made with rice flour. I had bánh mì for lunch one day and don’t remember anything particularly distinctive about it. It tasted like bread. 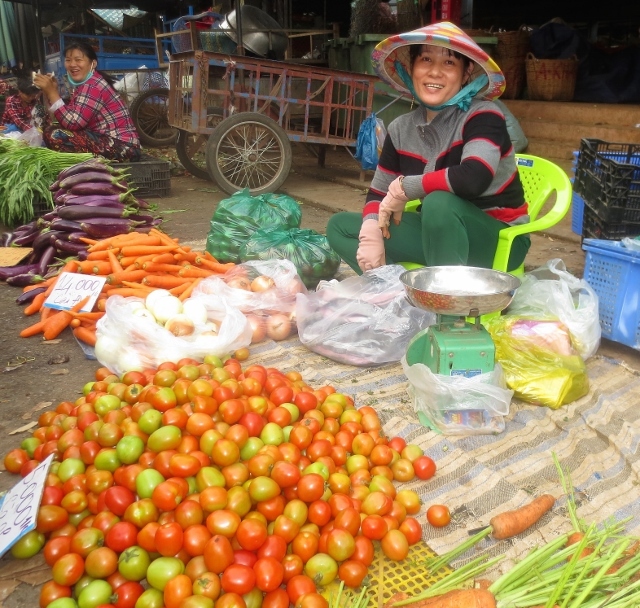 But I do remember well the genuine warmth – and smiles — of the Vietnamese people. 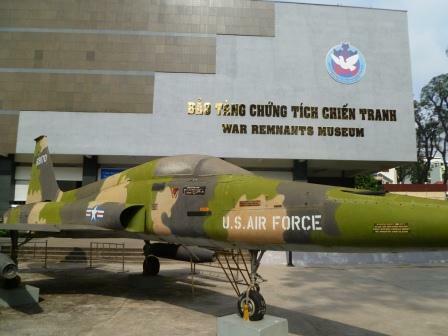 Nowhere is this more apparent than a museum dedicated to the Vietnam War in Ho Chi Minh City, the former capital of South Vietnam that was known as Saigon when it was America’s military headquarters during the war that ended 36 years ago. Henry Stein, a friend from Tempe, and I had long wanted to visit Vietnam. We are both old enough to remember how the war divided American society in the 1960s and early ’70s, but were too young to have been drafted. We were interested to learn how the Vietnamese people feel about America today as well as seeing some of the sites devoted to the war in which more than 58,000 Americans died. The title was later shortened to “The Museum of American War Crimes,” and then took on its current name in the mid-1990s when diplomatic relations between Vietnam and America were normalized. Regardless of its title, the museum is full of over-the-top propaganda about the alleged atrocities committed by American troops, whom the museum calls “the foreign invaders,” on Vietnamese civilians. There was almost a full floor devoted to Agent Orange, a herbicide used by the U.S. military to defoliate jungles that enemy troops used for cover. There were numerous photos of choldren born with birth defects the Vietnamese claim were the result of exposure to Agent Orange and even a grusome display containing deformed fetuses. In a yard outside the museum, there were so many American tanks, airplanes and helicopters on display — weaponry that had been abandoned when the U.S. withdrew its troops from Vietnam in 1973 — it almost looked like a U.S. military museum. As an American, it was painful to see how our troops and government were portrayed. There were even comparisons made to the Nazis. Yes, there wre civilian casualities during the Vietnam War, including the well-documented My Lai massacre. But I believe an overwhelming majority of our troops acquitted themselves bravely and honorably during the conflict, which was lost not because our military was defeated on the field of battle, but because the American public had grown weary of a war that seemingly had no end in sight. 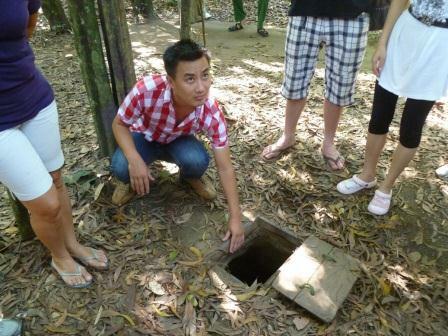 The following day, we visited the infamous Cu Chi Tunnels north of the city, which the Viet Cong used as a base to attack Saigon. Despite the anti-Americanism we witnessed at government-run sites, we found the Vietnamese people to be friendly, welcoming, and always quick with a smile. “We forget the past,” a tour guide told us. Indeed, it’s a chapter of American history that many of us from that generation would like to forget but never will. HO CHI MINH CITY, Vietnam – Carefully following the directions I printed off the Chabad-Lubavitch website, I set off on foot in Ho Chi Minh City in search of the sole outpost of Jewish communal life in the Socialist Republic of Vietnam. I passed the InterContinental Hotel on Hai Ba Troung Street and made a right turn at the heavily guarded French consulate. 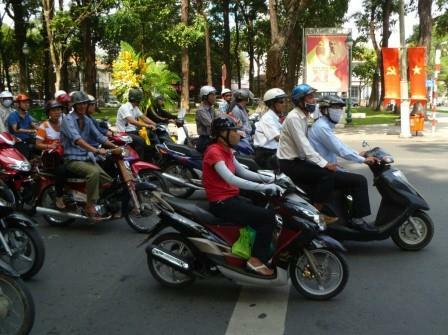 Each street crossing was perilous with throngs of Vietnamese motorbike drivers seemingly paying no attention to pedestrians. Even the sidewalks offered little respite from the chaos as food stalls, newspaper hawkers and parked scooters left scant room for walking. It might have been a rather unusual setting for a Jewish house of worship. But as I learned when I stepped inside and met with Rabbi Menachem Hartman, Judaism in this Southeast Asian city of 9 million people is surprisingly robust. As we sipped papaya shakes prepared in Chabad’s kosher kitchen, Hartman, a 29-year-old Israeli, told me about Jewish life in Ho Chi Minh City. He and his wife arrived here in 2006 to establish the first permanent Chabad center in the country. Hartman said 150-200 Jews – “it’s up and down” – live in Ho Chi Minh City year-round. They are drawn to the country for its growing economic opportunities, warm climate and relatively inexpensive cost of living. There is also a group of businesspeople whose work brings them to the country on a regular basis, as well as Jewish travelers coming for a one-time visit. I fit into the latter category, as I was on a 10-day vacation in Vietnam and Cambodia with my friend Henry Stein of Tempe. 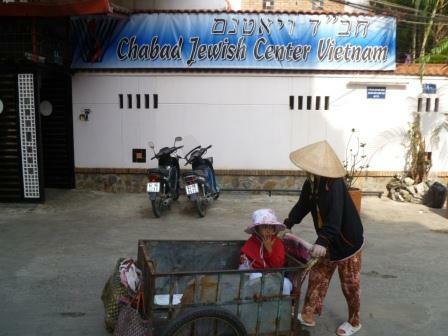 Wherever they come from and whatever brings them to Vietnam, many feel compelled to connect with fellow Jews and visit Chabad House. He said 40-50 visitors attend Shabbat services every Friday evening. Afterward, they sit down to a meal of homemade challah, Israeli salad, soup and kosher meat imported from nearby Thailand. To keep up with the growing number of visitors, Chabad moved to a new facility in October, twice the size of its previous location. The kosher kitchen and a spacious restaurant occupy the first floor. The second floor houses a sanctuary and library. The top floor hosts Sunday school classes and an everyday kindergarten with six children enrolled. During my December visit, the school was closed because Rachel Hartman, the rabbi’s wife and one of the school’s teachers, had temporarily returned to Israel to give birth to the couple’s third child. There also are plans soon to build a mikvah, or ritual bath. During his tenure in Vietnam, the rabbi has presided over seders, High Holiday services, one bris and three bar mitzvahs, one of which was for a family that stopped in Vietnam while on a cruise. When Chabad first opened in the country, Hartman said there was some reticence on the part of the Vietnamese government, which was concerned that there would be an attempt to convert the local population to Judaism. Hartman said he has met several dozen Jewish war veterans who have come back to visit the country in which they fought 40 years ago. One veteran – a doctor and regular Chabad visitor – returns each year to volunteer at a medical clinic. “He told me he comes every year because he wants to give back to Vietnam what America took during the war,” he said. Hartman said there is hope that it won’t be long before there is a formal Jewish presence in Hanoi, the capital city of Vietnam. 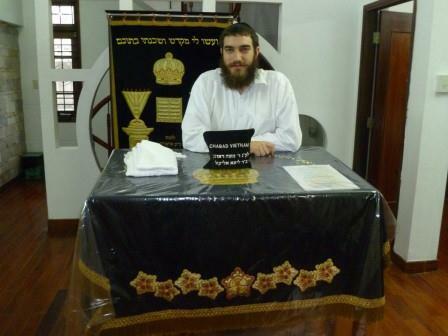 Another Chabad facility recently opened in Phnom Penh, the capital of neighboring Cambodia. “If there are Jews, there is Chabad House,” he said. Before I left, Hartman showed me Chabad’s guestbook, which was full of glowing comments from recent visitors. One note was written by an American woman who had visited in December. She was traveling with her husband, who adheres to a kosher diet and would only eat fish at local restaurants.